A first look at Virgin Voyage's external design shows off a futuristic looking prototype ship. Under construction in Italy, Fincantieri will deliver the first of three ships to the new brand in 2020. The ships will be 2,800 passengers and 110,000 tons and are being built at an estimated cost of $710 million each. The cruise experience will be for guests aged 18 and over, with no children allowed. "Adorned at the hull you’ll find our beautiful, mermaid guide. Inspired by the traditional bows from ships of yore, she is our ship’s muse. The soul of the voyage. Our elegant leader. The feminine spirit of the ship," said Virgin, in a statement. "Designed with the glitter and glam of a yacht, the ship’s livery stands out on the high seas. She glides with a unique level of sophistication paired with an unapologetic aire of mystery. A design meant to excite and inspire sailors to want to explore every corner." Virgin is also offering a pre-sale, in which a $500 deposit will guarantee a spot on the list for a cabin in 2020. The start-up brand is referring to passengers as "sailors." 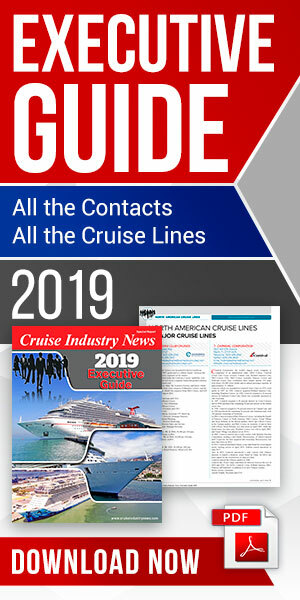 "From dining and entertainment to wellness and rejuvenation, nearly every single element of the Virgin Voyages journey will bring a unique Virgin Style to the high seas – and not just for our 2,800 Sailors, but also for the 1,150 crew members who will reside there and make amazing happen," the company added.